Halichoeres iris is one of the most peaceful, even reef safe wrasses. I have a Slingjaw wrasse in my tank, and I recently discovered it was missing a chunk from its fin. I had a puffer in there that I am sure caused this injury, and they have been separated. My question is will this part of the fin grow back? Should I do anything to the fin? I plan to treat the water with some antibiotics and anti-fungal medicines. <Better if you leave it to heal with no medications, just keep an eye on it, you can add some vitamin supplement to the wrasse´s food and maintain good water quality>. and if the size is too large, but you should be able to see the outline of the fin at the least. Thank you. I do hope all is well. Firstly, thank you so much for helping me, and other fish lovers, with your wonderful site and insight! I have what I hope is a quick question for you. I have a 350 litre “sea bottom” tank �� It can in no way be described as a reef tank or a fish only tank, but somewhere in between! I have several different species of macro-algae, as well as pulsing xenia, buttons and a couple of softies. The fishy inhabitants are a Yellow Tang, a Chalk Goby, a blue/green Chromis, an Azure damselfish, a small clownfish (started out orange but is now turning darker) and a Melanurus wrasse – who was my most recent addition about four weeks ago – and who is a gorgeous, active fish! I would like to add one more fish, ideally another wrasse, as “Mel” has now become my favourite fish in the tank, but I’ve done so much research that my brain is boggled! I’ve read that mixing wrasses can work, especially if I add a fairy or flasher wrasse, but other forums say it’s not an option. Do you think a Carpenters or McCosker's wrasse would work with Mel and his other tankmates? Failing that, I’d thought about an Orchid Dottyback but feel it would be intimidated by Mel’s whizzing about; likewise with a Royal Gramma. I’ve also considered a Flame Hawkfish but given that these like to eat feather dusters and I’ve got a huge colony of these tiny guys, I think this is a non-starter. My only other though is a Flame Angel but, apart from the fact that I’ve tried these before and lost them within weeks of introducing them (some months ago now admittedly), now that I’ve got the corals, I’m fearful that a Flame angel might start nibbling them, as many other fish keepers have found! Any thoughts about my final addition would be greatly appreciated! over. Thank you so much. Now to the business at hand. I have a fairly new 45 gallon tank that has been up and running for a few months. Ammonia 0, nitrite 0, 80 degrees, ph hovers around 8.0, calcium 480, dkh 11. Current inhabitants are: 2 ocellaris clowns, a juvenile redline wrasse (Halichoeres biocellatus), a blood shrimp, blue porcelain crab, various snails, various zoanthids and a couple of leathers. Everything is doing great! I'm planning for what will probably be the last fish inhabitant and I really want it to be another wrasse. One of the reasons for going with the Halichoeres biocellatus was their reported easy going nature. 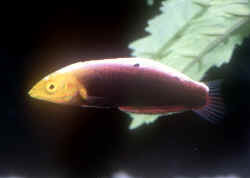 I don't think it would be appropriate to try to squeeze a Cirrhilabrus species into the tank. I know the Paracheilinus species aren't keen to be kept solo, so they're out. The Pseudocheilinus are too feisty for my tastes (especially in a tank this size). In my estimation, that leaves the Wetmorella species. If there's not another wrasse you'd suggest keeping, is there a sociable, outgoing dottyback (fridmani? ), or basslet (Assessor flavissimus?) that you'd feel comfortable with? That was a lot! Sorry! Thanks again so much for all that you do for the hobby! Well, I added the orchid Dottyback last night. I drip acclimated for about 90 minutes after the lights went out in the tank. This morning, about 12 hours later, the Dottyback is out and about exploring its new surroundings. The odd part is that the redline wrasse is nowhere to be seen. He's usually zipping around as soon as the "sun comes up". Is the new addition the reason for his shyness? I also got a mushroom rock about the size of a baseball that went onto the sand bed. Did I trap him underneath, or would he be able to wiggle out if that was where he had chosen to sleep last night? Wrasse made his grand appearance shortly after your reply. Who knows why he chose today to sleep in? Strange. Anyway, I thought you'd like to know! I have a 12' 460 gallon aquarium, stocked with a 5.5" Harlequin Tusk (can be very aggressive to new additions- he was particularly so with my Birdmouth Wrasse who he chased repeatedly), a 6" Birdmouth Wrasse, 5" Majestic Angel, big Snowflake and Zebra Moray and a 9-10" Golden Puffer amongst a number of Domino Damsels. I was thinking about adding at the same time a large Sling-Jaw Wrasse (Epibulus insidiator), a Moon Wrasse (Thalassoma lunare) and a Yellow Moon Wrasse (Thalassoma lutescens) to the mix. I have plenty of live rock split into two islands with a large open water swimming space in the centre of the tank. Do you think these Wrasse<s> would be suitable with my current stock and with each other, particularly adding the two Thalassoma wrasse? Lastly, slightly off topic I have had both the Harlequin Tusk and Majestic Angel for 3.5 years now and have noticed minimal growth in both, particularly with the Majestic. Do you know of any reason for why this may be the case? Perhaps as I see them every day I don't notice the growth as much. Thank you for your time and advice, I appreciate it a lot! Thank you so much for your passion for aquatics! Your help and guidance over the years has been amazing! A friend has given me a Cigar Wrasse which I think may be Hologymnosus sp. There is not a lot of info on these. He had it for about 2 years in which it had outgrown his 50g reef. I currently have it in my 155g reef. It appears to be reef-safe so far but is a rather rowdy fellow. It has taken out a few crabs and snails and takes a great liking to flipping over small rocks. It is obviously looking for food items and I have been quite impressed at how strong it is, flipping over several rocks that are 4-5" in size as well as an 6" Open brain coral, which I was forced to remove. My question is that I would like to add some sand dwelling corals such as Fungia sp, and Scolymia sp. but I'm pretty sure that the wrasse will flip them upside down. Would you recommend gluing or epoxying these corals to rock or glass? My gut tells me no on these. Would a Cuban Hogfish and a Corris Gainard get along in a 265gallon tank? My Corris is about 5-6inches long. Just a guess but I expect if I ordered the Cuban it would be about 4inches. <... one r in the genus Coris... likely would get along in this setting. Hello! 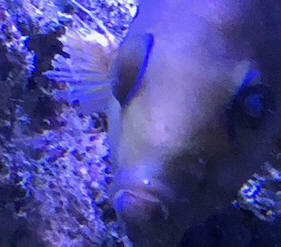 : ) I am having a bit of trouble with my pair of pink streaked wrasse. Although they used to spawn about once per 3 days, they do not anymore and the male is being QUITE aggressive with the female. 1. Am I correct in assuming that she has turned into a male? I say this because, although I haven't noticed any color changes, she no longer gets swollen during their spawning time. 2. Is there any way she could turn back into a female? 3. Do you think it would be possible to house these 2 in my 120g or should I catch one in the small tank where it would be much, much easier? to an established 210 gallon tank which contains 3 yellow Coris wrasses (medium to large). My procedure when doing this is to put the new fish inside a 5 gallon tank in the DT. This allows me to see the reactions of the main tank inhabitants and to let them get accustomed to the new fish while allowing me the opportunity to remove it if necessary (I would put sand in the bottom for it to hide). Your thoughts on this method and the compatibility of the wrasse would be appreciated... Inhabitants are Majestic Angelfish 6", Regal Blue Tang 6", Foxface 7", Sailfin Tang 5", Flame Angel 2", Bicolor Angel 2" (I successfully added this one with this method), 2 Clarkii Clownfish, one large one, 3 Blue Damsels 2", Six-lined Wrasse 2", Harlequin Sea Bass 5" all in a FOWLR plus everything but hard corals. -you do a great service to the hobby and industry. I have a 180-gallon reef that has been setup since 1997, over that time it has gone through many different transformations in rockwork, equipment, lighting and such but over the course of the last two years I have been extremely happy with the end result and it has gone relatively unchanged with the exception of adding coral (primarily SPS) and fish (tangs, Anthias and a majority of different wrasses). The main DT and satellite tanks drain into a 90-gallon sump which is then disbursed, back to the display, a 55-gallon frag tank and a 30-gallon refugium. Now that I have given a small description of my system, comes my question, In my DT I have three small tangs, a Yellow, a Red Sea Purple and a Red Sea Sail Fin. A male and female square patch Anthias, three green Fiji Chromis and the rest of the fish are various different wrasses. They include an Ornate Christmas wrasse, a leopard wrasse, an African exquisite wrasse, a red finned fairy wrasse, a solar fairy wrasse, a McCosker's Flasher wrasse, a female Hawaiian flame wrasse and a hooded fairy wrasse. Shortly after this past Christmas, I purchased the last and final fish, a Male Hawaiian Flame wrasse which just finished its 6-weeks in QT. I waited until all the lights were out in the DT, the DT was feed heavily just prior while my male flame was being drip acclimated. This was my prized addition, I got him a little on the thin side but over the 6-week QT built him back up to a healthy robust specimen, he looked fantastic. Once I added him to the display, I watched him under the moon lights as he poked around finally settling into a small cave with the rockwork. The next day when I came home from work a sit in front of the tank as I do every night and spend about a half hour visually scouring over everything then feed the fish. All the fish come right to the front glass as they usually do every night with the exception of the Male flame which I assumed was still adjusting to his new surroundings and being shy. Two days later, still no Male flame sighting when feeding the tank, later that evening I did see him bolt across the front of the tank and dive for refuge under a rock shelf just above the sand bed. After two more days of disappearance I was really starting to worry. Last night while turkey basting my rockwork, I must have blown into his hiding place and he shot up to the top of the tank. He looked nothing like the same fish I added approximately 1-week before, he was slimy, sand was stuck all over his body and his fins were ripped to pieces. He stayed at the top of the tank long enough for me to pin him into the corner and scoop him out with my hand before rushing him back into the qt tank that I continually keep up and running. He was breathing very heavy at the time but now has since calmed down and settled into the QT. I added some SeaChem Stress Guard last night and again this morning and will keep a close eye on whether he is eating or not but the real question to this long winded blabber is of the current list of fish referenced above which of them do you feel would have been the most likely to fight cause such damage, I personally feel it was the Exquisite wrasse and the Red finned Fairy. The reason I am asking is that once the Flame is healthy enough to be put back into the display, my plan is to capture the other wrasses and put them into the 55- gallon frag tank or refugium to hopefully break them of their territorial habits before adding them back to the DT once the male Flame has gotten himself re-established. Thanks for the advice Simon! I have spoken with the LFS that is responsible for the construction of my tank, and it looks like a Tennenti Tang is going to be pretty difficult to get hold of, so I'm going to have to think about what combo I get some more. I have another question for you regarding fish compatibility. A while back, my Sohal was responsible for the destruction of a Lineatus Wrasse (she sent it carpet surfing while I was out of town). I learned my lesson and covered my tank, and replaced the Lineatus with a Labouti <Laboutei> Wrasse. After 3 or so months, my Sohal started picking on it (it was the next largest thing in the tank). The decision to get rid of my Sohal was made firmly when she also sent the Laboutei carpet surfing - the fish was stronger than my hybrid glass/light diffuser cover was heavy. All the while, I had a Mystery Wrasse that hid 80% of the time, but got along with everyone. I love Lineatus Wrasses, and always wanted to try my luck with one again when I had an appropriate home for it, so once I found a home for my Sohal, I started looking for one. I've now had a 2.5 inch lineatus in my 20 gallon quarantine for two weeks. I removed the Sohal today (she's gone to a much bigger home), and added my Lineatus to the display. Well, I guess the Mystery Wrasse got used to being the king of the hill in the month and a half it was the only Wrasse in the tank. It reduced the Lineatus' fins to shreds in minutes. It only stopped when the lights went off. I had heard they could become aggressive, but as this particular fish had lived peacefully with two previous Fairy Wrasses, I thought it would be fine. My plan is to remove the Mystery wrasse and send it to my quarantine tank tomorrow. I will likely need to remove every piece of rock to do that, but that's my own darn fault I suppose. My question for you is whether or not you think a 'cool out' period will mellow it out, and let the lineatus establish itself. If so, how long would it need to be separated? The quarantine tank has lots of rock for it to hide in, but I don't know how long it will take the mystery wrasse to 'forget' it's old territory. it's going to need to find somewhere else to live. The Mystery was well established when the Laboutei was added, and it didn't even bat an eye. This sudden change in behavior is most distressing. The Mystery Wrasse still has all of it's lines, and is at most 2.5 inches long, so I don't think it's even an adult yet. <No problem Adam, please try to capitalise the names of your animals if you write in again..
My Mystery has been removed and sold to someone from a local reefer forum. I'm either terrible at making traps, or it's a smarter fish than I thought, as all I caught with the four traps that I made were snails and crabs. I ended up having to remove all my rock to get it out (Grrrrrrrrr). I also had some fortuitous news from my LFS. They put in a request for a Tennenti on their last order and lo and behold, one showed up. I've got my name on it, so once it's proven that it reliably eats prepared foods I'll be bringing it home. It's a juvenile, so it should be perfect for my 90 gallon for the next 7 or 8 months. If I could get a female Lineatus, do you think it would get along with the one I currently have in my 90 gallon, or would I needed to have added them together? My question for you is about stocking lists for my next tank. My two favourite families of fish are the wrasses and tangs, but it's always such a fine dance figuring out what can and will live together. My LFS had a M/F pair of Flame wrasses (Cirrhilabrus jordani) come in on the same shipment as my Tennenti, I've never seen them in person before and I completely fell in love. I don't think they would be appropriate in my current tank, as the Lineatus will have been living in it solo for nearly a month before they would come out of quarantine. I also have a Cinnamon clown pair that recently started laying eggs and they seem to have exclusively claimed about 1/4 of the tank. I never noticed them being aggressive until I took the Sohal out, but now they even attack my hand when I scrape the glass. The female drew blood yesterday, so they probably won't be making the move to the new tank. The egg laying is cool, but so is my skin. Do you think that I could get away with a harem of Lineatus and Flame wrasses in the same 320 gallon tank? I realize that dimensions may be as important as volume, so to give you an idea, the tank is a custom build and will be 6'1" long, 3' feet wide and 30" tall, more square than long. I plan on having plenty of rock arranged in several 'islands' with open sand between them. The LFS also brought in a Rhomboid wrasse that took my breath away, so if it was possible to have harems of three kinds of wrasses in a tank that size, that would be my choice for the third. I like the three most expensive wrasses in the hobby though, so if I'm going to do this I need to be sure they'll get along. From what I've read here, I think three species might be pushing it. If that combination is possible, how many females would be appropriate? And is it acceptable to add females later? I've read your entire wrasse compatibility page and the general rule seems to be 'add them all at once' and 'don't give one male females, but not the other'. I just don't know if it will be possible to get that many animals of the desired sexes at the same time. I could most likely get male Flame and Rhomboid wrasses at the same time to add together with my Lineatus, but I don't know how many females of each species I could get at once. Then for the tangs - I love the Tennenti, but it's not the most colourful fish in the sea. I will obviously be adding it to the 320 first and giving it some time to make it's claim, then I would like to get one of either a Powder Blue or Brown, depending on if I can get a healthy specimen of the right size (and right species if it's a Powder Brown). After that I'm not sure what other tang to add. I think three Tangs will probably be the max for that tank, so I would like the third to be as colourful as possible. I was thinking maybe a Zebrasoma xanthurum, as they are quite spectacular, but I don't know if this pairing would be possible given it's innate aggression. Maybe a smaller specimen, added last, but I'm open to suggestions. I don't plan on adding many more fish, except maybe some very small guys that will sit on the sand/hide in the rocks after a good population of copepods has established itself. When you say only keep one species as a harem, do you mean only keep one species of wrasse per tank if you do a harem? Is it possible to keep a harem of one species, and individuals of another species in the same system? Also, what constitutes a 'harem'? My LFS only orders and sells Flame Wrasses in M/F pairs. Could a harem of Lineatus Wrasses be housed with a m/f pair of Flames? Or would a single Lineatus with a harem of Flames be more appropriate (assuming I could special order in only females). I've been doing more and more research on Tang compatibility, and the more I read, the less convinced I am that a powdered tang (blue or brown) is a good idea with a Tennenti. I know I'd need to make sure I got A. japonicus and not A. nigricans if I went the brown route, but I've been reading some horror stories about A. leucosternon aggression on forums that gives me pause. I've had a Naso tang suggested to me as an alternative, as that would mean I wouldn't be grouping animals from the same genus, but I'm concerned about size. They are a beast of a fish when they grow up, yet every fish retailer online lists a 125 gallon as a minimum size. I have a hard time swallowing that number for an 18 inch fish. My tank will be over double that volume, but still only 6 feet long. What are your thoughts? Again, thanks for your time. I can't tell you enough how much I appreciate it. to my 225 gallon tank (with 90 gallon sump) and am concerned about its compatibility with some of my other inhabitants. Some say that the fish is reef safe, others say it is not, but all say it likes to bury in the sand at night. a convict blenny, and a huge pig of a mandarin. he's a happy little guy, and the mandarin due to competition for pods. I know I've got an odd combination of fish, but it is the result of combining two tanks and I've been fortunate that everyone gets along well. I have a variety of soft corals. Would I be flirting with disaster to add the wrasse? Thanks so much for the quick reply! Beautiful fish, but more risk than I'm willing to take with my other inhabitants. I appreciate your input and no doubt my fish do as well! I have noticed that my wrasse has been eyeing and attacking my clam. It has pushed its head into the siphon, causing the clam to retract. It has also nibbled at the mantle. The clam has not been opening as often, or as wide. Is this normal behavior for a wrasse, or does it sense that the clam is sick? I am thinking of catching and selling the wrasse before my clam is dead. Any suggestions? Pass On The Wrasse? Dear Scott, <Hey there!> Thanx again. Just wonder, as you didn't mention in your reply, about the 6 line-wrasse. <Oops- must have been sniffing too much coral glue last night! Sorry..> Do you think it will be a problem with the hermits and snails?? <Not to the extent of other wrasses. In fact, Sixlines are good fishes to have if you keep clams, because they are known predators of snails that can bore into clam mantles, causing damage> Basically, wondered how the wrasse would work out with hermit crabs and snails and if it could get along with a goby as they both seem to like the substrate areas. <They might prey on smaller snails and hermits, but are usually very peaceful with other fishes. You'll just have to consider the possibilities and decide what works best for you> If you have time let me know what you think. If you're too busy I understand. <Never too busy!> Actually, I'm not sure how you manage to answer so many emails in one day! You must be a quick reader or typist! <Well, there are about 20 of us crazy fish nerds on call, so we manage just fine! Besides, this is FUN!> Regards, Greg <Any time! Take care! Scott F.> ps If what is a "Sea Swirl"? (I'm a Sea Swirl man, myself) If I want the sinusoidal wave thing here could you send to China and could I call to give a VISA number so it's not going out over the internet (not sure yet if I wanna get one now, but just in case). Lunare Wrasse I recently added a 4-5" Red Sea Lunare Wrasse to my 90 gal. fish only tank. I have a 7" Majestic, a 5" Asfur, a 4" Yellow Tang, a Percula, a Three Stripe Damsel, and an Orange Tail Damsel. The wrasse has been doing great for about two months but he recently started to harass my two Angels! He is constantly picking away and destroying there beautiful fins. I removed the Wrasse for about ten days and then so the Angels could get a stress break. When I returned the Wrasse he continued to pick at the fins. Today I am removing him again. I thought that these were supposed to be peaceful community fish? Is there any hope that this behavior will change? There is plenty of hiding places in the tank and I even tried lowering the temperature by a few degrees over a seven day period. Maybe I'm not feeding enough? Thank you, Chuck >> Maybe the feeding will help... but this tank is actually a little small for all these "territorial" fishes... in the wild the two angels and the Thalassoma lunare would never put up with each others presence in such a small volume as 90 gallons... Bob Fenner, who would trade the wrasse in. Compatibility I have a four inch lunare wrasse. He is extremely aggressive and quite hardy. He has killed in the past. I want to add some clownfish. I also want an anemone. I was hoping you could give me some species that could hold their own. My wrasse wants the place to himself. I would like around four clowns. If possible I would like all different species for variety, if not which can get along with own kind? I have had problems with ich in the past. My wrasse never gets it. I have tried everything from lowering the salinity to copper. I wish there was something else I could do so I won't have to take out all my liverock and invertebrates. Please Help! >> Umm, where to start... Yes the species, Thalassoma lunare can be a real territorial terror... Try taking it out (put it in your quarantine set-up... you're going to put up), and introduce your clowns (after freshwater dipping them)... and allow them to get situated for a few weeks before returning the Lunar Wrasse... and the number of species of clowns you can house and likelihood that they'll get along with each other and that wrasse is a function of the size and shape of your system... if it's small... like forty gallons. One species of clown... at 75, maybe two, one hundred.... you get the idea?